The soldiers, some two Green Berets and six conventional troops from Fort Bragg’s Security Assistance Training Management Organization and four infantrymen from 1st Brigade, 10th Mountain Division, visited the Nigerian Army Infantry School to train 200 soldiers from the 26th Infantry Battalion. SATMO, Gouthro’s unit, is mostly known for providing support to foreign military sales. Recently, SATMO soldiers have gone to countries like Slovakia and Colombia to train their troops on that new equipment. “What’s unique about the Nigeria mission, for us, is that it’s not tied to any specific type of sale,” Gouthro said. 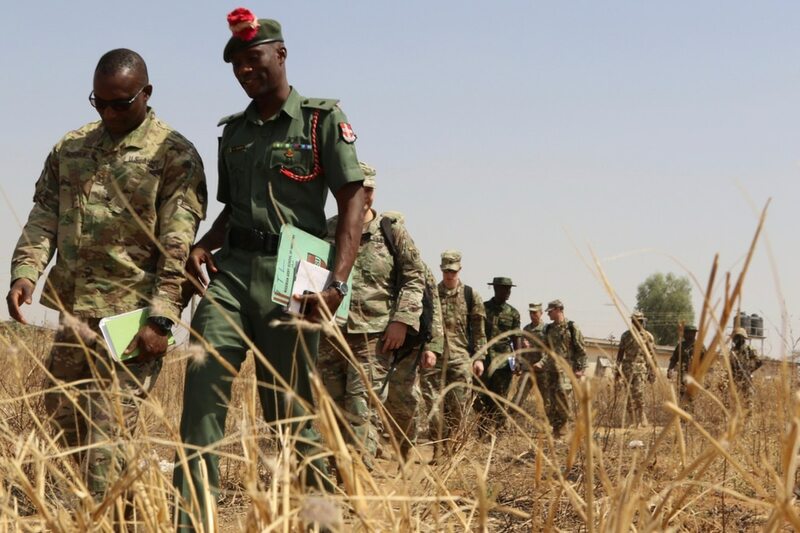 Instead, the group in Nigeria focused on advanced infantry skills, starting with patrolling and counter-IED training, working up to movement-to-contact and ambushes or raids with a platoon-sized element. 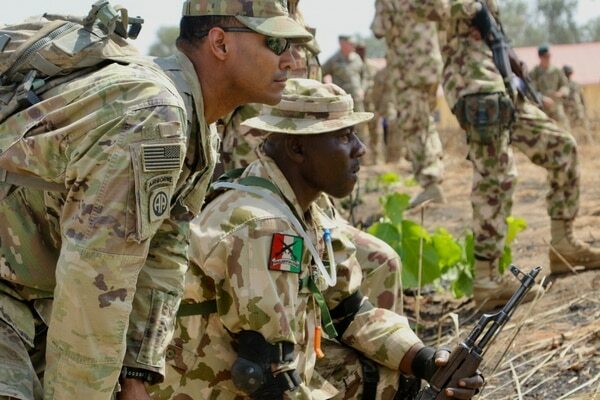 Every day, according to the group’s noncommissioned officer-in-charge, the U.S. soldiers would take the Nigerian soldiers through a variety of training lanes. Those rotations would go on all day, with a midday break. “We take them out, we assess their capes, and then we try to improve what they already have,” Campbell said. According to Gouthro, what they already had was more than his soldiers expected going into it. They had the basics, Campbell said. So the group shared their skills, while being careful not to dictate how they manage discipline and organization. The SATMO members had some experience with training Iraqi and Afghan forces, he added, but they didn’t want to pre-judge the Nigerian army. “We were very impressed at the level of motivation and desire to learn that the Nigerian soldiers brought to the training,” Gouthro said. And, he added, in all likelihood the 26th Infantry Battalion will soon be using those honed skills in theater. “They’re not specifically slated for a deployment, that we’re aware of, but we know that the rotation will come around for them to rotate up north, to the Lake Chad Basin, where most of the conflict is in the country,” Gouthro said. While soldiers from both Special Forces and civil affairs backgrounds have been deploying to the area for years to help local forces stabilize, the U.S. presence in the region came to a head late last year when an ambush killed four Americans deployed to Niger.